SHELDON PLENTOVICH skims across the surface of the ocean, riding on what looks like a wakeboard, except there is no boat, no outboard engine noise or gasoline smell. "I surfed. I rock climbed. I was a volleyball player in college," Plentovich said. "But this is the ultimate. Since I started kitesurfing, I haven't done anything else." She is one of many surfers, windsurfers and water enthusiasts who are taking up the new and growing sport. The name says it all. 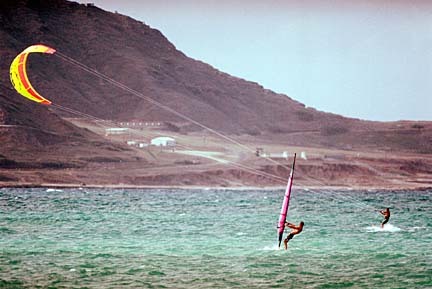 A large parafoil kite with two or four lines catches the wind and powers the surfer through the water. Waves are used as jumping ramps, propelling her into the air. "It's all about getting air. It's that freedom. You're like a bird. Being an ornithologist, maybe that's what appeals to me," Plentovich said. Cost: Lessons $60 to $380. Equipment, $700 (used) to $3,000 for top of the line. When not kitesurfing, the 29-year-old Plentovich does research on endangered species for the United States Fish and Wildlife Service. She recently spent two years on a South Pacific island studying the Marianas Crow. Endangered species may be an apt description for kitesurfers, at least at Kailua Beach Park. Some members of the community are trying to have kitesurfing banned there. In the hands of a novice or someone who lacks respect for other people, a large kite and its long nylon chords can be dangerous. "We're trying to get the word out to all kitesurfers that they have to be very aware of their surroundings and careful when they're kitesurfing near the public," Plentovich said. "All it's going to take is one mishap or one child hit by one of these kites, and that will be the end of kitesurfing in Kailua." Other than the actual equipment, good physical conditioning and a willingness to learn are all that are required to take up kitesurfing. Of course, knowing how to swim and a certain level of comfort with the water are also required. According to Plentovich, kitesurfing basics are relatively easy. The kite catches the wind and propels the surfer. But she does recommend taking lessons from an expert. "Knowing how to deal with the lines is really a timesaver," she said. "When you're setting up, they can get tangled and knotted. If you get your lines set up right you'll avoid having a huge kite completely out of control just whipping around and crashing into everyone." Prevailing winds that frequent Kailua Beach Park or Mokuleia Beach Park on the North Shore are a must for kitesurfing. The best type of winds blow steady side-shore to the beach, allowing the novice to simply climb out of the water when he reaches the far end and trek back upwind for another session. It is possible to sail into the wind, using much the same dynamics a sailor uses to push his boat into a headwind. But this does take a bit of expertise, and so kitesurfing in areas where the wind blows off or on shore is not recommended for anyone not completely familiar with kitesurfing's intricacies. The onshore winds will blow you into the beach. This is dangerous both for you, your kite (which may become tangled in trees or power lines) and especially for swimmers and other beach-goers. Again, being aware of the public is important for kitesurfers. "We don't want to start losing places to kitesurf already, just because a small number of kitesurfers are inconsiderate," Plentovich said. With the dramatic rise in the number of people kitesurfing, overcrowding is starting to become a problem. The best idea is to avoid crowded spots until you are capable of completely controlling your kite, Plentovich said. The sport is expensive to get into. You'll need a kite that's big enough for your body size and the wind conditions in your area. These run up to $2,000. You'll also need flying lines, a control bar with a safety leash, a board with footstraps and a surf leash for the board. You may or may not also want a wet suit to stay warm. A harness is also necessary. A helmet, gloves, shoes and eye protection are also recommended. Most of the required equipment is now becoming available on the used market. Check the classifieds and ask people in the parking lot of kitesurfing beaches.